Lawyer John van den Brand (1864-1921) from Medan is known for his manifesto “The millions of Deli” on labor excesses on the east coast of Sumatra. 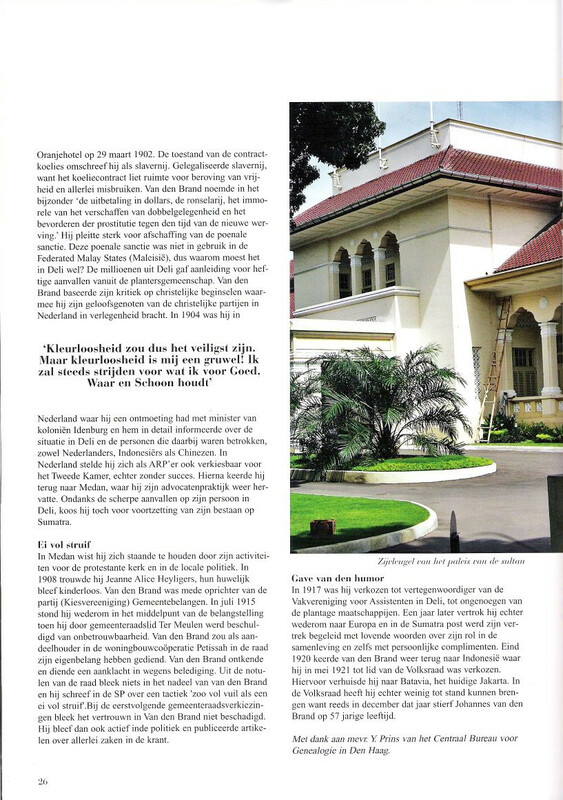 In addition, van den Brand was successful lawyer, editor of Sumatra Post and and an active city councilor in Medan. In October 1902 van den Brand the published the brochure “The millions of Deli”. The world was shocked by this brochure which described the inhumane practices of planters against Chinese and Javanese contract workers, or the so-called “coolies” in the tobacco plantations. It was an endless list of coolie abuse. Especially in the early years of the plantation industry from 1865 to 1900, Deli was the district where tobacco was grown and it was an infamous place which had a reputation for its harsh working conditions. The brochure by van den Brand resulted in a government investigation by the commission Rhemrev in 1903 and the establishment of a labor inspection in 1904. In the subsequent years, the situation improved slightly even though the circumstances were difficult. An important factor was the so-called ‘penal sanction’ which entailed the contractual prohibition of coolies to leave the plantation for a time period of three-years, making them virtual slaves to the tobacco companies. The penal sanction was introduced in 1880 because of the large number of runaway coolies in the previous years. ‘De Sumatra Post does not side with a particular party nor is it a magazine with a particular religion, nor for a specific audience. The paper focuses in this microcosm, to people of all kinds of direction, of the most diverse feelings and inclinations, a good comparison would be- Dreyfusards and anti-Dreyfusards together, to Oil and Tobacco. This paper speaks, sharply, from an opinion, in whatever field, and it seeks to provide a platform for lively discussions for the people that wishes to disagree. To retain a neutral opinion is not what this paper is about, I will always, to the extent of my powers, fight for what I believe is Good and pure, which brings to mind a phrase by Schiller: “Kannst du nicht Allen gefallen, mach es wenigen Recht. Allen gefallen is schlimm! “(If you cannot please all through your deeds and work of art, do justice to a few. To please many is bad.” (difficult). “My friends, people will bury us all! Let the brown brother, the worker in our service, be awarded with a funeral according to the rules of his faith and the adat of his tribe. Something which we hope to obtain for ourselves. When he visited cities he also published his impressions. For example, about Malacca on 21-7-1899: Life is cheap, the people willing and alcoholics. Van den Brand, however, achieved national fame after the publication of his pamphlet “The millions of Deli” that followed the meeting “interests of the East Coast” which took place at the Oranje Hotel on March 29, 1902. The condition of the contract coolies he described as slavery. Legalized slavery, because the cooliecontract left room for deprivation of liberty and all sorts of abuses. Van den Brand said in particular “payment in dollars, the ronselarij, the immoral of providing the opportunity to gamble and promotion of prostitution at the time of the new recruitment.” He advocated strongly for the abolition of the penal sanction. This penal sanction was not in use in the Federated Malay States (Malaysia) so he protested that it was in Deli. 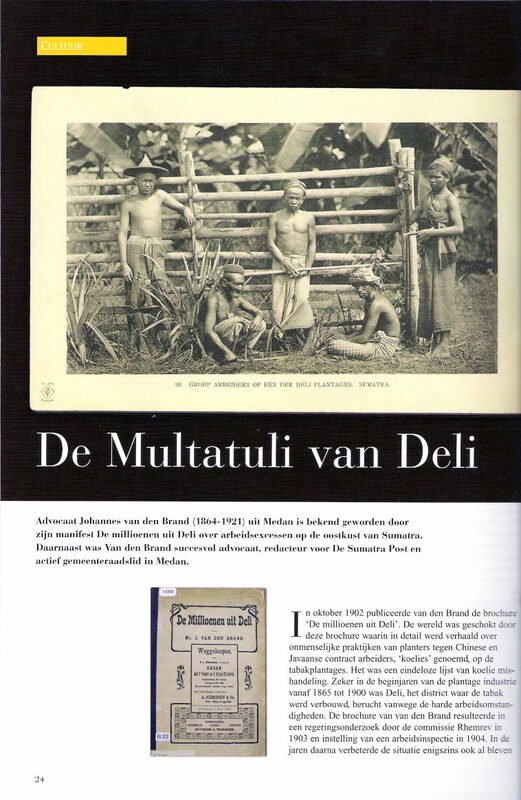 Van den Brand: “In British Malaya, one does not find wealthy Europeans as one would in Deli… Which is of more importance to man than his personal freedom? The slogan “Long Live Freedom” may be accompanied by only “Down with slavery”. (SP 1-4-1902) The millions of Deli gave rise to violent attacks at van den Brand from the planter’s community. Van den Brand based his criticism of the planter’s on Christian principles and left his fellow believers of Christianity and the Christian political parties in the Netherlands embarrassed. In 1904 he was in the Netherlands where he met minister of colonies Idenburg. Van den Brand informed him in detail about the situation in Deli and those who were involved, both Dutch, Indonesians and Chinese. (Brief van den Brand 1904; Breman, 1987:195) In the Netherlands he introduced himself also eligible for the Lower House for the Protestant party, but to no avail. After this he returned to Medan, where he started his law practice again. Despite the sharp attacks by the people he criticized in Deli, he chose to continue his life on Sumatra. In the end of 1920 van den Brand returned to the Netherlands Indies, and in May 1921 he was elected to the People Assembly. 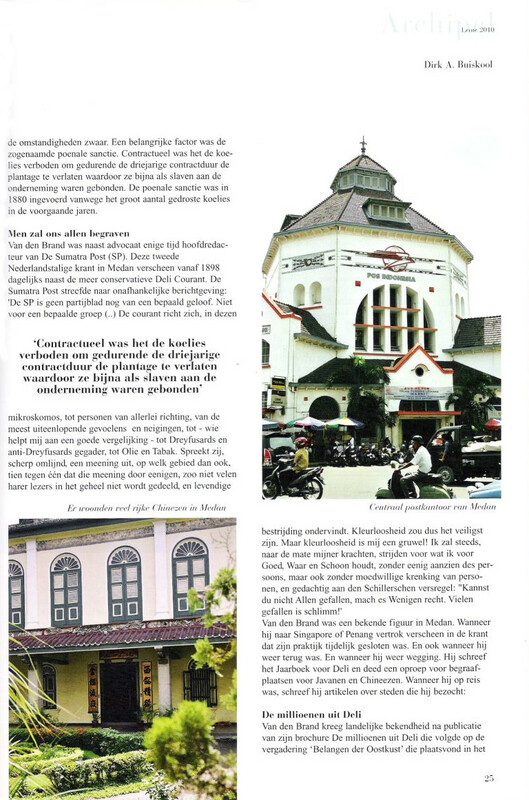 For this, he moved to Batavia, currently known as Jakarta. At the People Assembly, however, he could not achieve as much as he would have liked, as in December that year Johannes van den Brand passed away at the age of 57 years.